When you consider that 8K means you have to have a little over 33 million pixels to achieve a resolution of 7680 × 4320, then obviously the larger the sensor the better. RED turned heads when it was able to put that many pixels into its Super 35 Helium sensor. But could you do the same with micro four-thirds? Well Sony isn’t so sure. When it comes to pixels, camera manufacturers have to perform a delicate juggling act between pixel size and density, and the key is real estate. 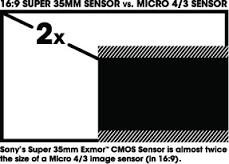 Or in this case, how large your sensor is. The larger the sensor, then the more pixels you can put on it. Some, though, choose to go the other route and use that larger area for larger pixels. The larger the pixel, the greater amount of light it can absorb. By contrast, if you’re looking to cram as many pixels onto a sensor as you can, well that means you have to make those pixels smaller, and that translates into less light being gathered by the sensor. It also means that you’ll invite more noise to the party as the camera seeks to compensate for less light by boosting the gain. Tanaka states above that larger sensors are more important to maintain image quality, and Sony is known for how well their full frame Alpha cameras perform in low light. To that end, Sony would end up sacrificing that capability in order to simply check a box on their resolution list. So unless Sony can figure out a way to stack pixels on an M43 sensor to get to 8K, it’s not likely that they’ll do it. But it sounds like they’ve already given it a lot of thought; so when Sony says that it may not be possible to place 8K on a micro four thirds sensor without yielding a snowstorm image of noise in low light, they may be right. That’s not stopping Panasonic and others from trying to crack it, however. They’re already flirting with 6K and then downscaling back to 4K with the GH5. But if Panasonic wants to keep going with the GH line, 8K is the siren singing while standing on the rocky shore. Speaking of Micro Four Thirds, ever wonder why those lenses are so expensive? Lee Morris over at FStoppers recently moved from his tried and true Nikons to the Panasonic GH5, and as such, he had a choice: He could get an adapter, or he could repurchase all his lenses. And it isn’t cheap to replace them. He chose to buy a few M43 lenses and he was shocked that the prices were over a thousand dollars. Ouch. Why are they so expensive? Morris compares the sizes of the lenses he bought, and they are half the size of his Nikon lenses. Frankly, with smaller lenses, it equals smaller tolerances. So, FStoppers’ Lee Morris getting ripped off, as he speculates? Well, probably not. M43 is a smaller market, even with the popularity of Panasonic’s Micro Four Thirds GH line. When you’re dealing with a smaller market share, you’re going to be paying more for a lens. In the end, it comes down to competition. But over a thousand dollars? Yikes. It may be cheaper in the long run to stay full-frame. Compare the m43 sensor to Sony’s various 20 megapixel BSI and stacked 1″ sensors. The pixel pitch for a 1″er at 20 megapixel gets you about 40 megapixels at m43 size. And BSI/stacked would be an improvement over today’s m43 chips. Sony may want to keep the good stuff to themselves, but this is at least possible.